Whether you need a teacher or a tutor to improve your language skills, a translator for an article to be published or an interpreter during a business trip, you are in the right place. For all the tasks regarding foreign languages ​​that you do not know how to do yourself, the "Polyglot Services" Freelancers are here at your disposal. 1 - Find any language service you need. Perform a search using the search box and find matching services. Read the job descriptions, compare prices, experience and read comments from the community to find a service that suits your needs best. If you have a specific request, just send them a personal message. You did not find the service you are looking for? Post a request. Members able to provide you with a solution will get in touch with you. 2 - Confirm and Make the Payment. Ensure the details are correct so the seller can provide the quality service you expect. Once you decide which service to buy, use one of our secure payment methods to pay for the service. Your money is safe: The seller will not be paid until you are satisfied with the service and you marked as 'completed'. If the order is cancelled, we will refund your payment. Processing fees: Processing fees are added at the time of purchase where a buyer can review and accept the total amount requested to pay. These fees cover payment processing and administrative fees. As of April 2018 the current fees assessed to the total purchase amount are 5%. Funds returned to your balance from cancelled orders will not include processing fees paid. If the service is delivered in a downloadable file format, you will have access to it immediately after the payment. If you need to physically meet or if the service is given using a phone/video chat, then communicate with the seller to schedule appropriate times and dates for both of you, using the built-in conversation system. The seller will deliver the service within a specified time frame. Once you are satisfied with the service provided, you can mark the transaction as completed and we will make sure that the seller gets paid. Help our community by writing a review for the seller. 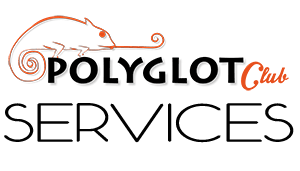 Buy your first Polyglot Service! "Polyglot Services" gives you the opportunity to turn your language skills and experience into a sustainable source of income! We're here to provide security, privacy and payments on time, so you can focus on earning money by delivering great language services. 1 - Post the service you are offering. Post a language service offering based on your skills and experience. Be as specific as possible about how/when you can deliver this language service: through online communication (video, phone), face-to-face meeting or an instantly downloadable file that you have created. Respond to customer inquiries within a reasonable time. Good communication is necessary to obtain a successful result. After you deliver your service, the buyer will mark it as completed and we will transfer the funds to your account after a clearing period (3 days). You can withdraw your funds to your PayPal account once it passes the withdrawal threshold. Fees: Each order you sell and successfully complete, accredits your account with a net revenue of 83% of the purchase amount. As you complete more jobs and gain positive feedback, watch your reputation grow. Customers will look for people who are reliable and well recommended. SELL your first Polyglot Service!